3. He was a year-end top-ten player for six consecutive years in the 1990s (1992–1997), a feat matched in the decade only by Pete Sampras. 5. His three Indian Wells Masters championships (1992, 1996, 1997) are an ATP record, equaled only by Roger Federer. 7. He has served as a national spokesman for the National Fish and Wildlife Foundation in the US. 8. In 2001, Chang served as a goodwill ambassador for the 2008 Beijing Olympic bid committee. 9. 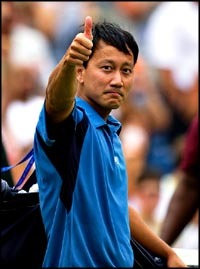 In 2002, Chang published a book about his career, Holding Serve: Persevering On and Off the Court. 10. He has a passion for breeding African cichlids in several large freshwater aquariums at his home.